Oh, boy, India! I have wanted to go here for, well, forever! But it has also been the country I was most scared to travel to. How was I going to cope with the poverty and all the people and all the noise? I can’t stand crowds at the best of times! During our initial loose planning stage of our trip I had hoped to spend a couple of months in India. I know it has a lot to offer and that going slow would be the way to not be overwhelmed. After our time in Europe extended way beyond expectations, I had to change my plans. I almost cut India out all together. 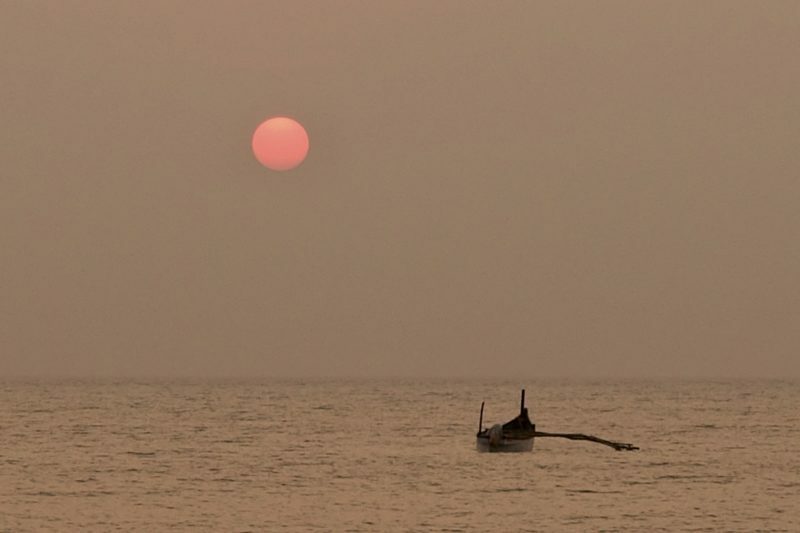 I still wanted to go to Sri Lanka though, so my compromise was we would spend just a couple of weeks in the south of India to give us a little taste on our way through. Goa and Kerala were the places I had in mind. We arrived in Goa at the ungodly time of 4:30am. I had hoped to catch a couple of hours sleep on the plane, but we had three of the most obnoxious people in the seats behind us. Not only were they continously getting up and down, bumping or kicking the backs of the seats, they were also loud. And I don’t just mean talking (although that too), they were singing and clapping at full volume. Now remember this was an early hours of the morning flight! I did consider talking to the flight attendant, but he was clearly on his first shift ever and was having enough of a problem just trying to serve the meals. So here we are, landing in a new country that I just knew was going to be a challenge, with no sleep. A recipe for disaster! Mostly though, I am happy to report, things did go smoothly. We did have a small issue when checking into our hotel. We had specifically booked a Hilton to take advantage of the early checkin that is a benefit of being a gold member. On arrival though the staff wanted to charge us for an extra day because we were there so early. It took a bit of convincing, and luckily Simon had emailed the hotel in advance to confirm that it would be okay. We were both asleep about three minutes after we were finally shown to our room. 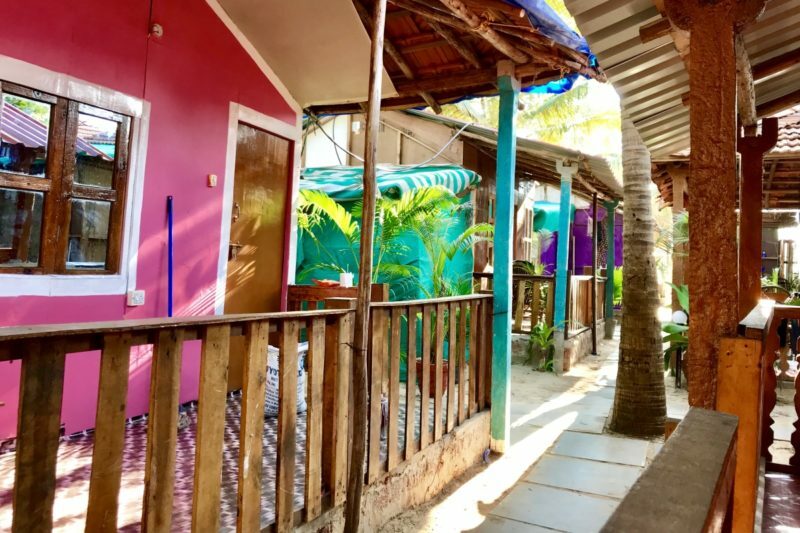 The next morning we jumped in a taxi to make our way down to Patnem Beach where we had booked five nights in a beach hut. By now we had been in India over a bit over 24 hours and hadn’t really seen any of it. Our initial ride to the hotel had been in the dark, and we hadn’t left the grounds since. So now we got our first look. What we had taken for back streets in the dark were actually the main roads here. I was shocked that the main highway through Goa is only one lane each way. Okay, so that means three lanes at least in reality, but it’s only meant to be one lane. The traffic was slowed down even more because they are building a new highway. Once opened in a couple of years that should help a lot. Our 90km drive took close to three hours and then we were deposited at a rustic looking beach area. We checked into our beach hut that was literally twenty metres from the sand. It was basic to say the least. A bed, and a room with a toilet, a shower head and a handbasin. Oh, and the bucket that would prove useful over the coming days. There was no electricity (although it did work intermittently) and no hot water – in fact no water at all until we got that fixed. But it was perfect. These colourful, rustic, basic beach huts were perfect for a few days relaxation. It was only a few metres from our beach hut to the sand. We spent our days sleeping in, wandering down to the beach for breakfast, lazing around some more, swimming, reading, eating, taking advantage of half price cocktails during happy hour each night and, well, that’s about it really, for five days! It was hot and sweaty and bucket showers three times a day were the norm but it was a perfect relaxing introduction to India. 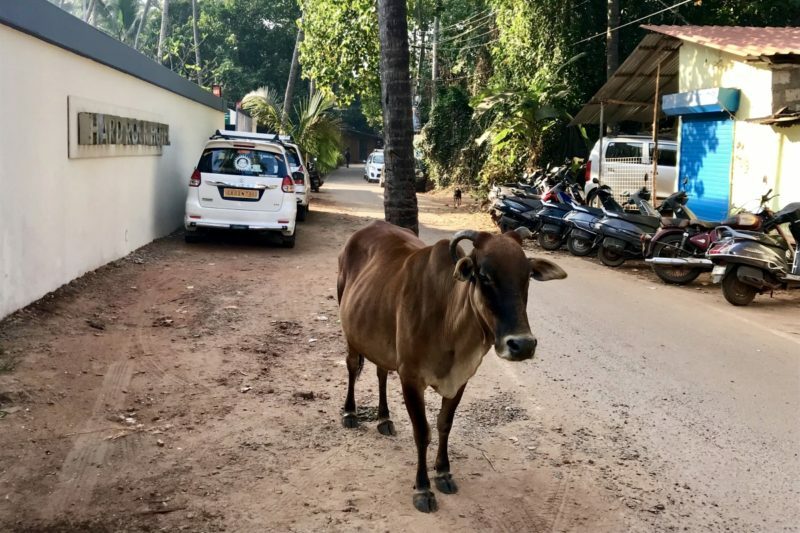 I was woken one morning at about 6am to the sounds of cows wandering right past our door. Their hooves were clattering on the pavers that made up our path to the beach. I jumped up to have a look and followed them down to the beach, where they were getting their beach time in before the crowds of the day. 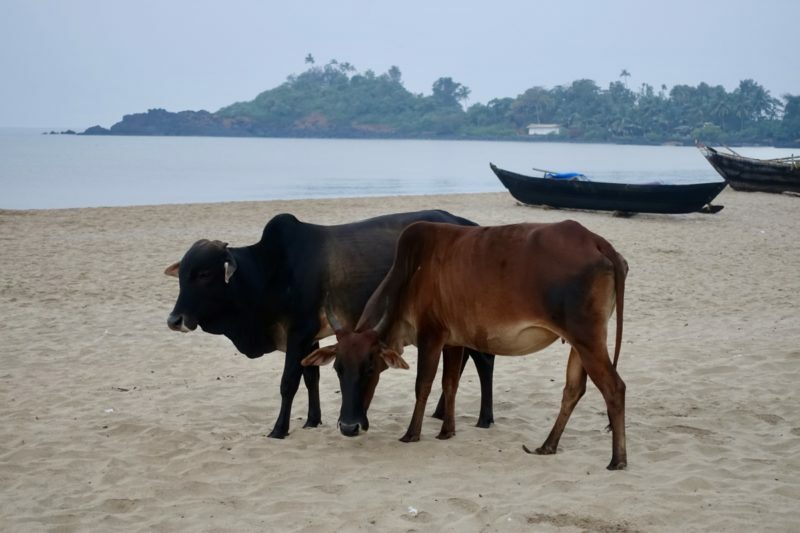 Some cows enjoying their early morning beach time. And by crowds I’m being a little tongue-in-cheek, as there were no crowds here. There were still lots of other visitors, but it was always possible to get a beach lounge, and there was plenty of spare sand around. I had heard that many of the beaches were crowded, so we went a fair way south looking for something relaxing, and that’s what we got. 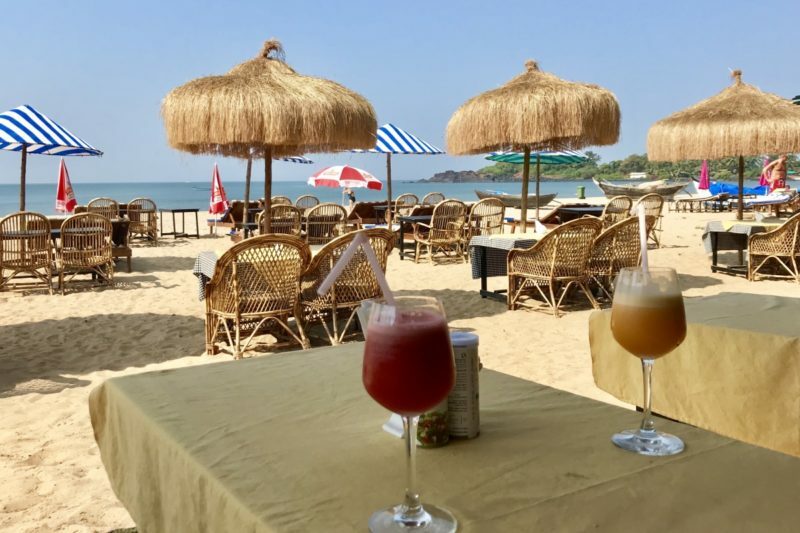 Five days goes quick when you are having fun, but I needed to wash my hair with something other than a bucket so we spent a night at the Hard Rock Hotel back up in Calangute to add that one to Simon’s collection. After cold showers I was really hoping for a piping hot one, but it wasn’t to be. This was the start of discovering that even five star hotels in India seem to have their hot water set at luke warm. In fact it can barely be called warm, it’s just no longer cold. And as one that loves really hot showers, this was going to be a challenge! Such a land of contrast! That sign on the wall on the left says “Hard Rock Hotel”. On the other side of the wall is a big fancy hotel and this is right outside the main gate. Mumbai was our next stop for a couple of days. It wasn’t initially on our list of places to visit, but a few things all conspired so it made it into our plans. 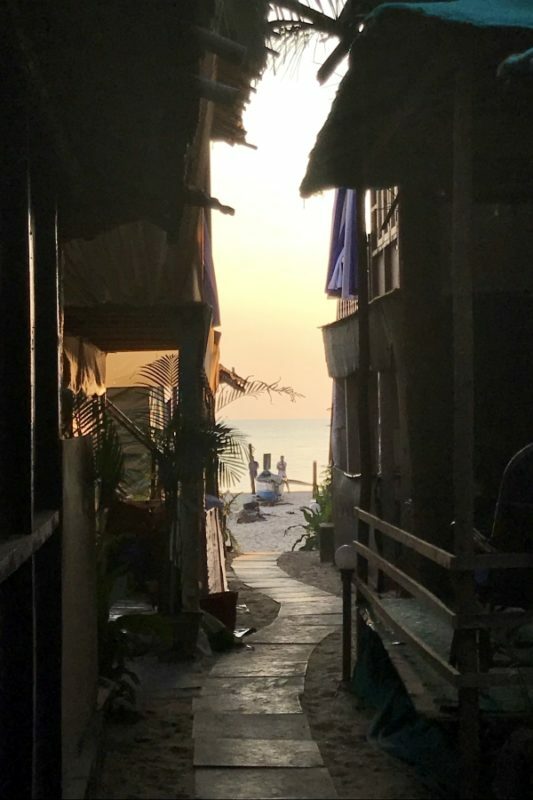 When I started looking for flights from Goa to Kochi, all the ones I could find were via Mumbai, then I came across the book “The Mountain Shadow” in a free swap bookshelf and I was reading that in Goa – and it was set in Mumbai. I was now curious to go and have a look. To add to the mix, we had met someone in Jordan who was a native of Mumbai and would be in town when we were, so it was an opportunity to catch up again. We spent the first evening with our friend Smita who showed us around what is the rich area of Mumbai. She grew up (and her mum still lives there) in a suburb over from where all the movie stars live – but even if we did come across one of the big Bollywood stars, I wouldn’t have had a clue! We checked out the local markets and ate at a fantastic vegetarian restaurant, with Smita ordering all kinds of things we had not eaten before. Not fancy food, but the food a local would eat every day. Absolutely delicious. 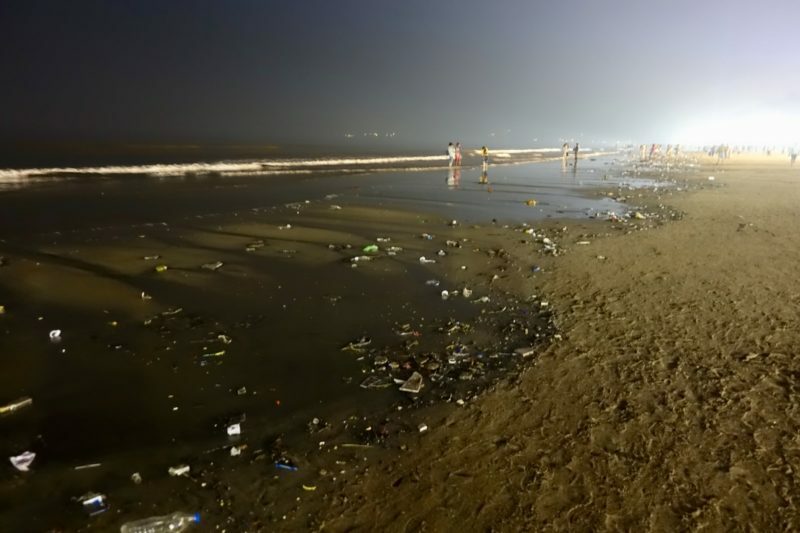 Rubbish on the beach in Mumbai. Don’t plan a beach holiday here. Along the beach front were a whole pile of fenced off, five star hotels. We went into one of them and hovered around the edge of a wedding that was happening. This one seemed to be rather calm, with only a hundred or so people milling around, but the food! There was enough food for a small army, and oh boy did it look good. It did cross my mind to sneak in a bit further and test some of it out, but in my casual western clothes, I didn’t think I would get too far. The next morning we decided to do a tour of the Dharavi slum with our hostel. 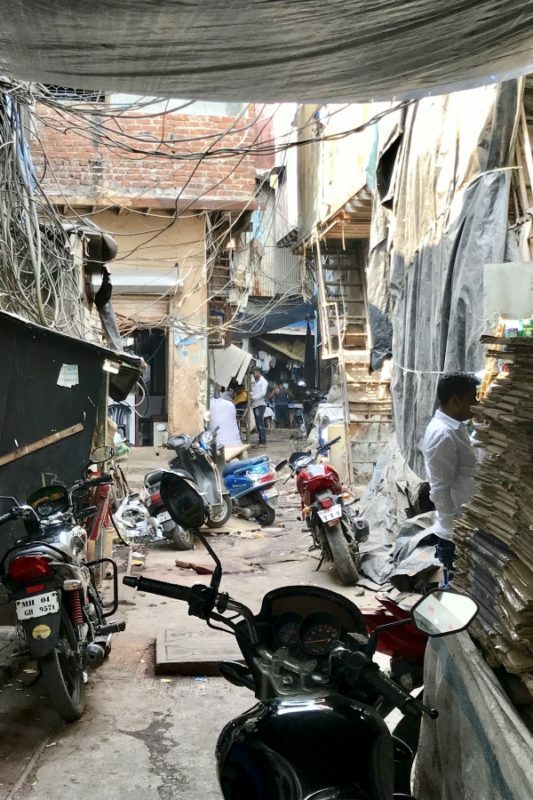 I was a bit hesitant to do a slum tour because of the ethical considerations behind tour companies making money from tourists gawking at the lives of others. I decided to go for a couple of reasons. Firstly, I feel like it’s important to see how others live to understand the comparison with our priviledged life. Also, Dharavi is not just a slum but a huge industrial area. It creates over $650million (USD) of revenue each year. This alone challenges every idea that I have about slums. We were learning that everything in India was flexible, and in this case, luckily it was. A group of five of us were doing the tour, and had all been told to meet out the front of the hostel at 9:30 and that our tour would be at 10am. At 10:15, we were still waiting, so someone goes back inside. The people at the hostel had forgotten to give us some vital details. We needed to get a taxi at 9:30 and met our guide at a specified place at 10! By the time we used Ola (an app not unlike Uber that is popular in India) to get a car, then got to the meeting place it was well after 11am. We were meant to meet our guide outside of a coffee shop. As we were hovering around, the owner realised what was going on. He knew the guide and gave him a call. Ten minutes later he arrived like nothing was wrong! Our guide talked a little about the history of the slums and pointed out some of the inconsistencies. There was no runnning water, but some industrious people had figured out how to steal electricity and cable, so satellite dishes could occasionally be seen on the rooftops. 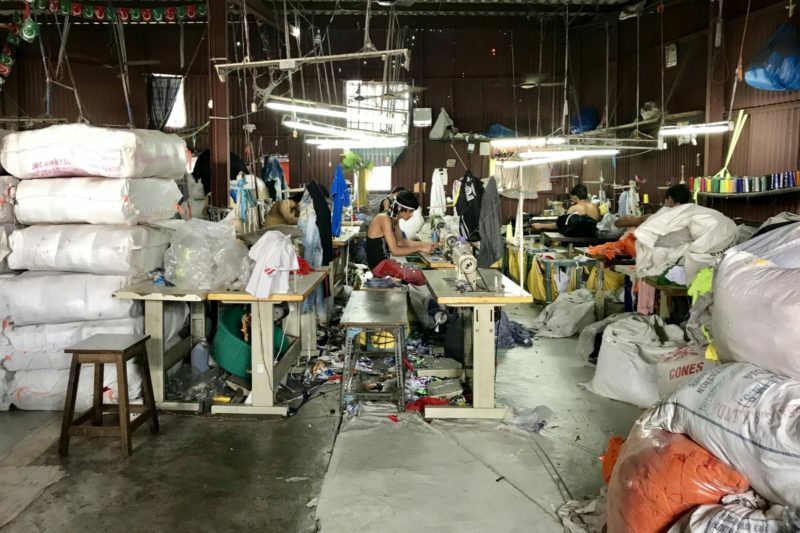 In the industrial parts of the slums we saw many businesses set up to recycle plastic, make clothes, suitcases, dye cloth, make leather and then leather goods. In amongst these are bakeries, food stalls and all sorts of little shops. One of the workshops in the slums. We were actually encouraged to take photos here. These people work and live in this space. Behind me is a small gas burner sitting on the floor which functions as the kitchen. A typical street in the industrial part of the slum. This is spacious compared to the residential part. We made our way over to the residential part of the slum. This is not to say people don’t sleep in the industrial part, they do, often on the floors of their work areas. The residential part is even more tightly packed. I am not a big person, but on some of the “streets” I could barely squeeze through without turning my shoulders sideways. Often too there were obstacles like parts of buildings over the top of the streets or exposed electrical wires we needed to duck under. In these streets were people going about their daily lives. Some were washing, others cooking, some just sitting in doorways and socialising with neighbours. We saw a school and an open area about the size of a tennis court where kids were playing. There were no photos allowed in the residential area out of respect to the residents, and I was glad to hear that. I didn’t find the slum tour as emotional as I thought it might be. 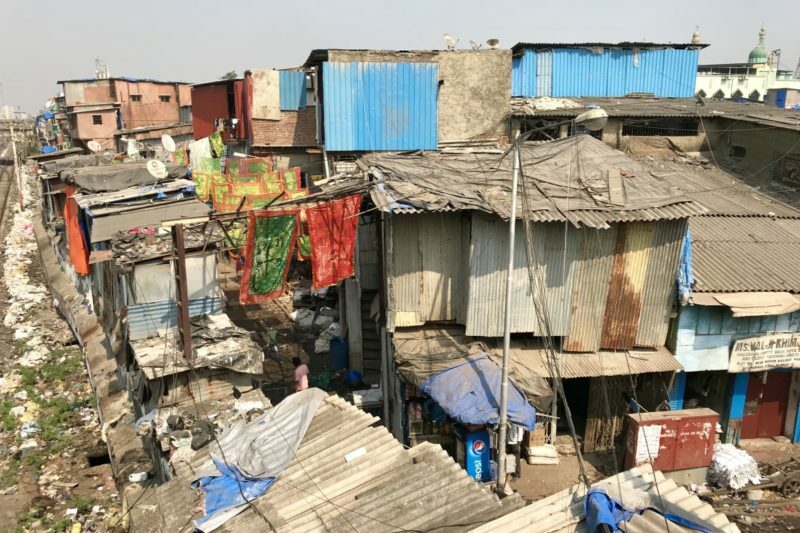 While the conditions these people live in are unbelievable – Dharavi slum has over 1 million people living in about 2 square kilometres, the most densely populated area on Earth – they do not act like victims. They are not waiting for some magic to come along and fix this for them. They are industrious people who are working hard to get the best they can out of life. People actually come here from rural areas of India to work and live as it gives them better job opportunities. In reality there is little hope that a family can move on from the slums though. Each person’s aim is to send their kids to school so that the cycle can slowly be improved for the next generation. Getting back from the slums was almost as adventurous. All five of us squeezed into this tiny van we hailed off the street. One of the others tried twice to get an Ola, but while we could watch them on the map, once they “arrived” we could not find them. We were waiting at a busy intersection – where our guide recommended we wait – and I think it was just too busy to be able to find us. Although as the only foreigners, we did stand out. Boy was I glad to be able to get out of that van and stretch my legs once we arrived back at our hostel. That night we grabbed another taxi to head out for dinner. Every time we jumped in a car, the driver always “knew” where we wanted to go. Until it came time to get to the exact location, and they no longer knew! This is the Indian culture, and I know that, but it doesn’t make it any less frustrating. So I always had to know the way myself, and without phone data, this meant preparing Google Maps before we stepped out the door. It was challenging directing people who spoke very little English, but we eventually got where we were going each time. The next morning it was back to the airport – but not to Kochi which was our original plan. We had changed our minds at the last minute and decided to squeeze in a quick trip up north. I mean, could we really visit India but not go and see the Taj Mahal? Depending on what is meant by “see the Taj Mahal”, then the answer is yes! But I will get to that! As we sat in the airport I turned to Simon and asked what day it was. Thursday! 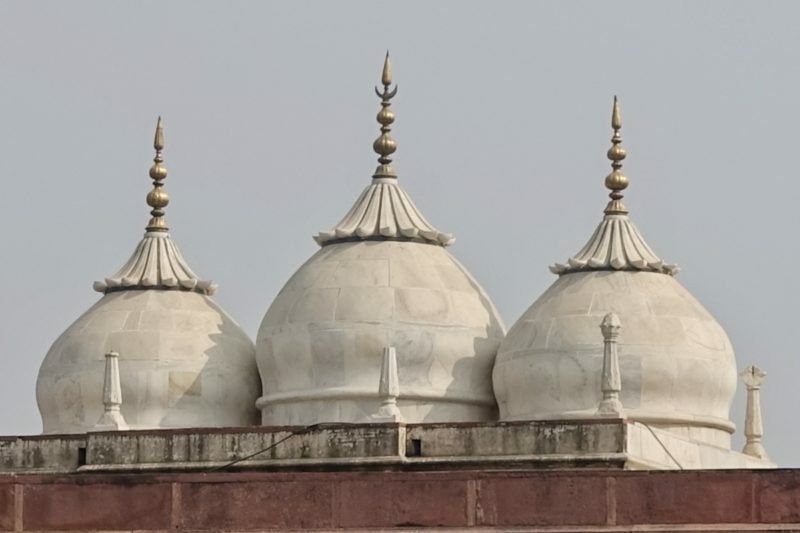 Oh boy, we hadn’t considered the day when we booked these flights, and I knew the Taj Mahal was shut on Friday. Oh well, that’s shouldn’t be an issue, our flight landed in Delhi at 11am, it was about two hours from there to Agra and we had booked a car to meet us at the airport and take up there so we had plenty of time that afternoon to see the Taj anyway. Boarding time came, but no boarding. The flight time came, and we were still not boarding. In the end our flight left about 45 minutes late. We quickly emailed the car company before we got on the plane to let them know. On arrival in Delhi our baggage took forever. It was about an hour after landing before we walked out of the airport – to find out our driver had left! We of course tried to call and sort it all out, but basically it was “Bad luck, you were a no-show!”. Time was ticking so we tried to find another car to take us to Agra. In India though, this is a process. First you have to sit down and relax, answer mulitple questions about who you are, where you come from, where you are going. These are not official questions, just chit chat. Then you are offered tea, which you have to accept, and a lot more discussion occurs until eventually you are given an absolutely insane price for the car and the bargaining process has to start. Even though I know this is how it is in India, it doesn’t make it any less frustrating when we just want to get where we are going! The first place we talked to was crazy expensive and would not bring down their prices, so we walked away and had to start the process again! We still paid way too much, but only half as much as the first quote! We had wasted another couple of hours in this process. As we left Delhi we still had a chance to get to the Taj Mahal. We hurtled down the new freeway at 100km/hr and all was looking good. About twenty kilometres from Agra there was a huge bang and the driver pulled over. The whole top layer of a back tyre had shredded and was now spread all over the road! Luckily the tyre was still in tact though, because if it had blown properly…well, I might not be writing this! We all got out and Simon started changing the tyre while the driver collected bits of the car from the road. Eventually we were ready to go again – and the car wouldn’t start. That was when I gave up on the Taj Mahal! After a few tries by the driver, we decided to push start the car. At least that was something on our side, the car was a manual so we could push start it. I got to be the driver while the guys pushed, and we got it going on the first go! 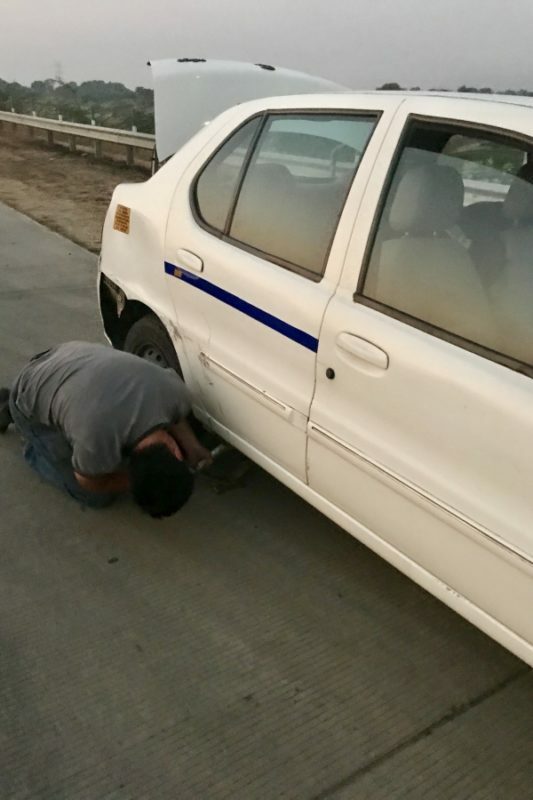 But we had to limp into Agra slowly, because of course the spare tyre was almost flat. By the time we reached our hotel it was about 7pm. At checkin they took pity on us and upgraded us to a room with a view of the Taj Mahal – we would be able to see it in the morning if the weather was clear. It wasn’t, and all we saw was fog! 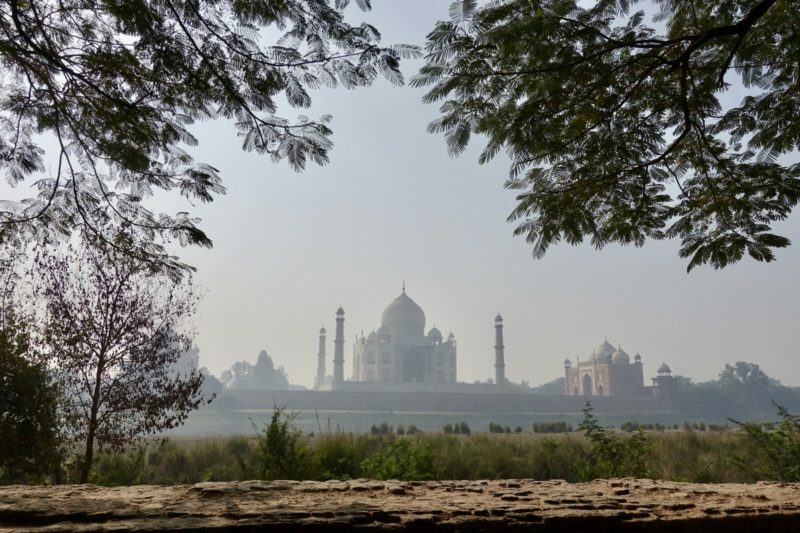 To get at least a glimpse of the Taj Mahal, we arranged a driver for the morning. 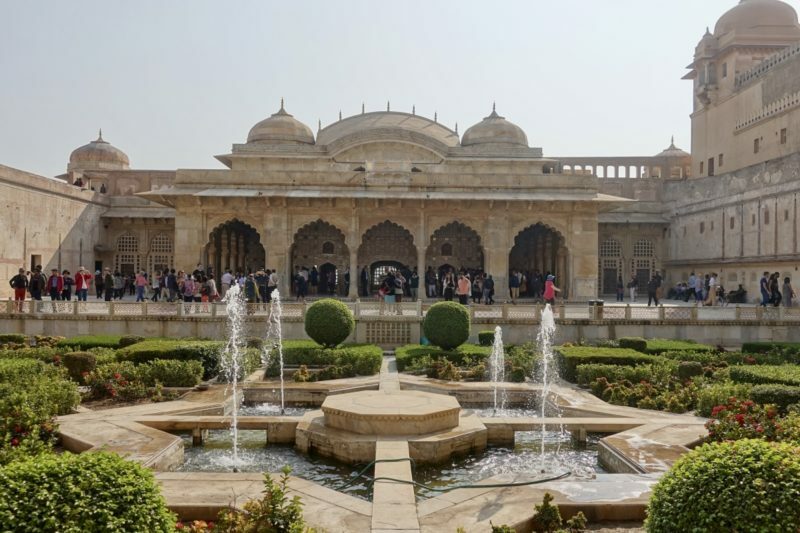 Our first stop was Mehtab Bagh, a park across the river behind the Taj. Through the fog we could at least catch a glimpse of the Taj Mahal. It isn’t the classic view, or up close, but it was at least something. Bittersweet, but something! 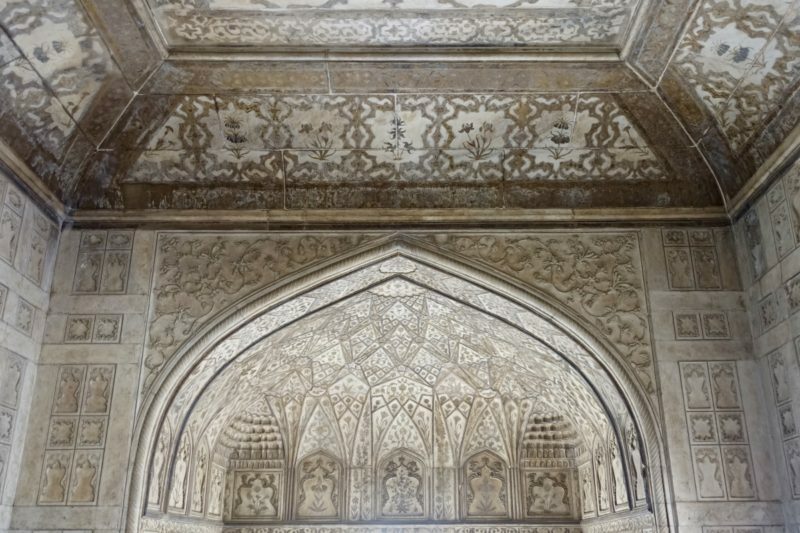 After a quick stop at a traditional ceramics factory we went to visit Agra Fort. 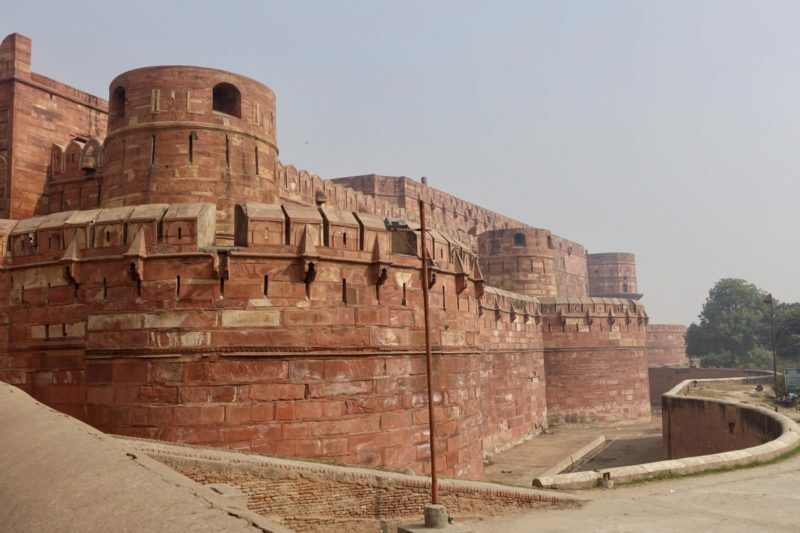 It’s a really impressive fort from the outside, all red brick and turrets. 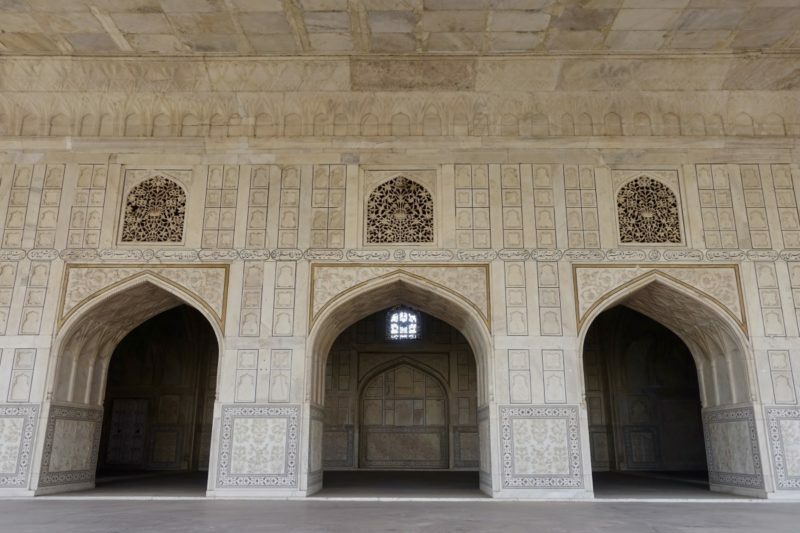 It has been continously changed over the last 700 years or so, but inside there is still some lovely architecture. 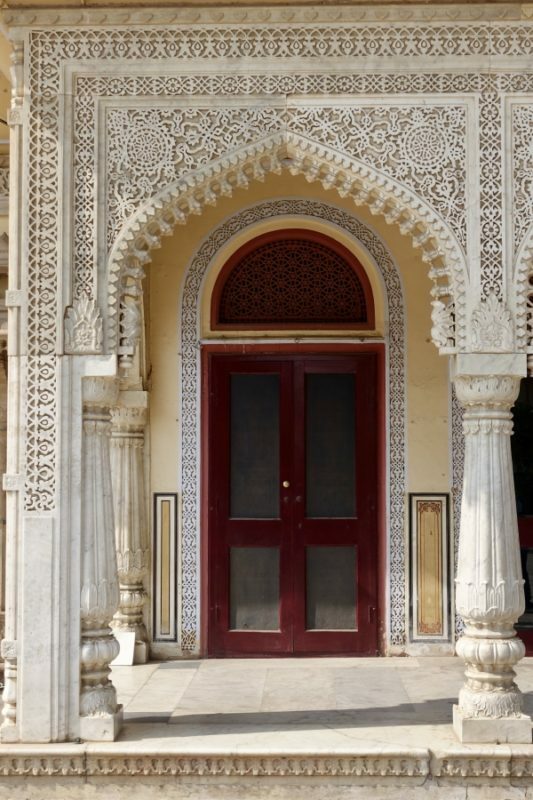 I love the scalloped arches and patterned screens. We also got some more views of the Taj Mahal in the distance. It would be lovely to see it from some of these vantage points on a clear day. 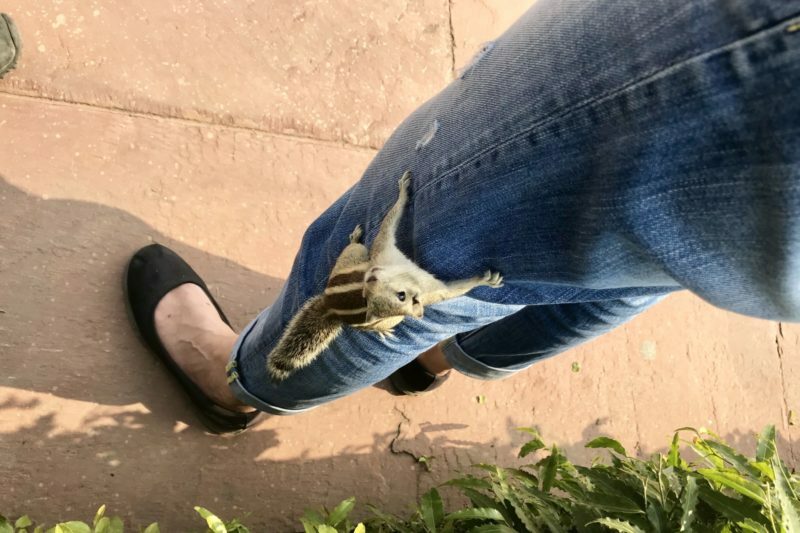 Since I am such a sucker for cute animals, I loved seeing all the squirrels running around in Agra Fort. They weren’t quite friendly – we couldn’t touch them – but they darted all around and we occasionally had to watch where we were walking. At one point though I was standing still and one ran straight up my leg! It sat there long enough for Simon to whip out my phone a grab a few shots, then it realised I was not a tree and off it went! 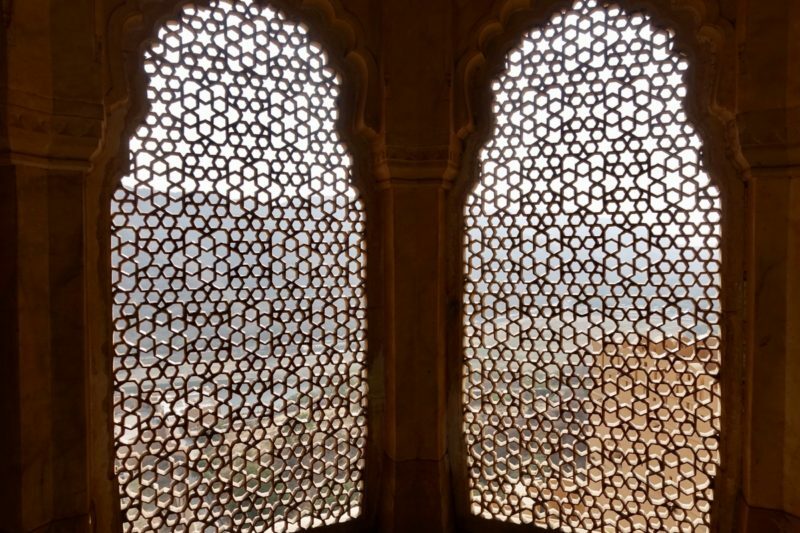 Our half day in Agra was now over and it was time to make our way to Jaipur. After the disaster and extra expense from the day before we decided to catch a bus between the two towns. We talked to the guy on the reception at our hotel and asked how he would get between the two towns. Of course he first went down the line of hotel car etc, but eventually he mentioned a local bus – but a slightly better version that the really basic buses. It was only a few dollars, so that was perfect. 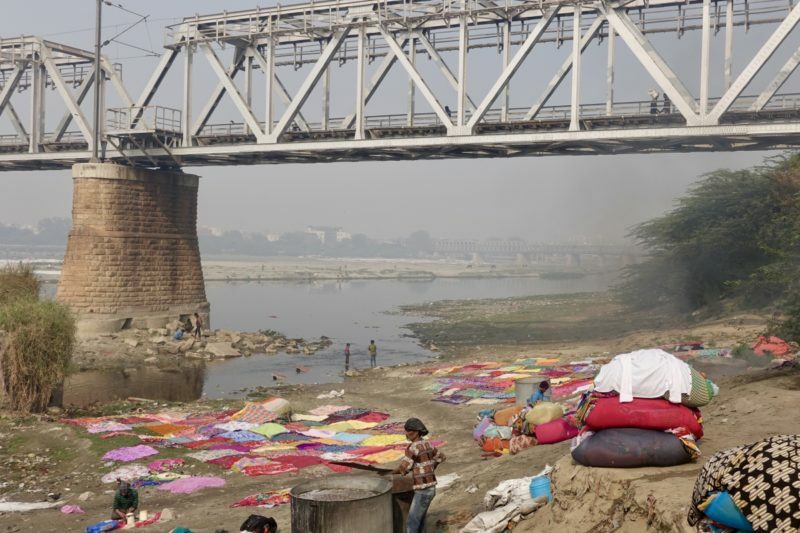 Laundry creating colourful patchwork areas on the banks of the Yamuna River through Agra. The ride was long – about five hours – but the bus was coach-style and comfortable enough. We arrived just as the sun went down. We jumped in a tuk tuk to get to our hotel, which was a bit outside of the city centre. This was another example where the driver said yes, he knew where he was going, agreed to a price, but didn’t know, and once we got there wanted more money because it was further than he thought. 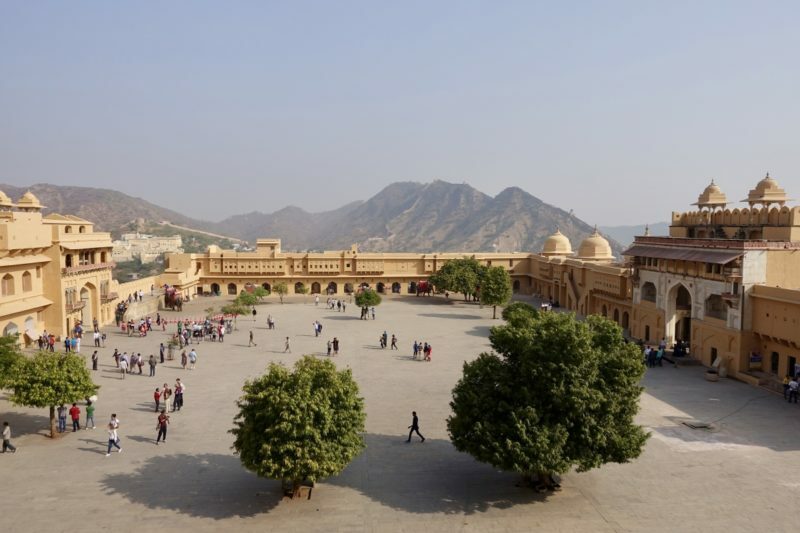 We only had one full day for sightseeing in Jaipur, so decided to pay for a driver so we could fit in as many sites as possible. 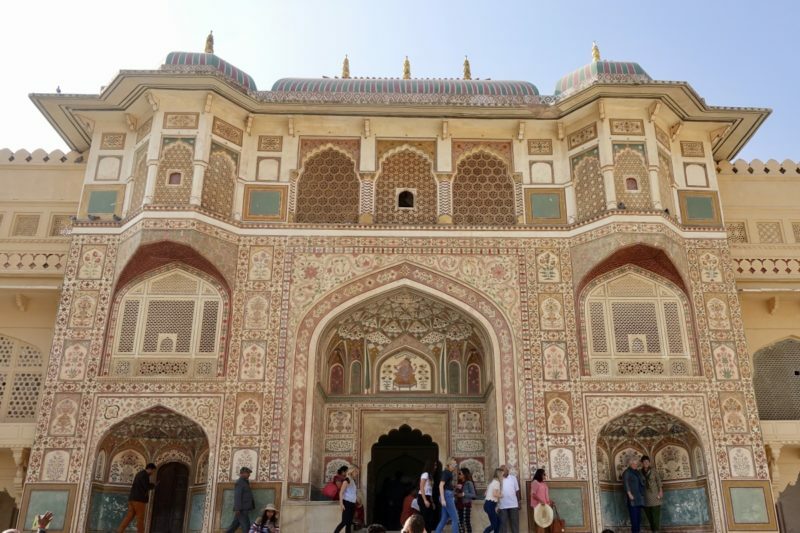 Our first stop was another fort, this time the Amber Palace. Most people enter the fort by elephant ride to the top, but we got our driver to drop us off at the top gate. 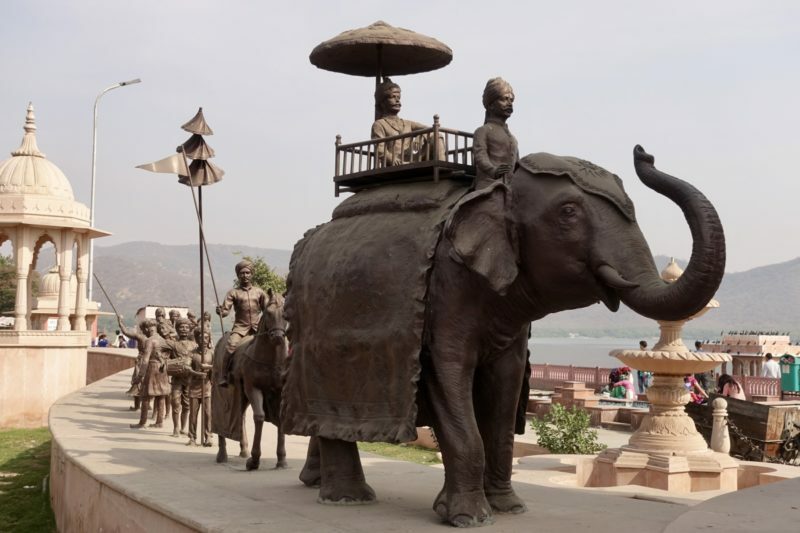 If you are visiting, don’t feel like your choice is either riding an elephant or walking all the way to the top, there is another option! 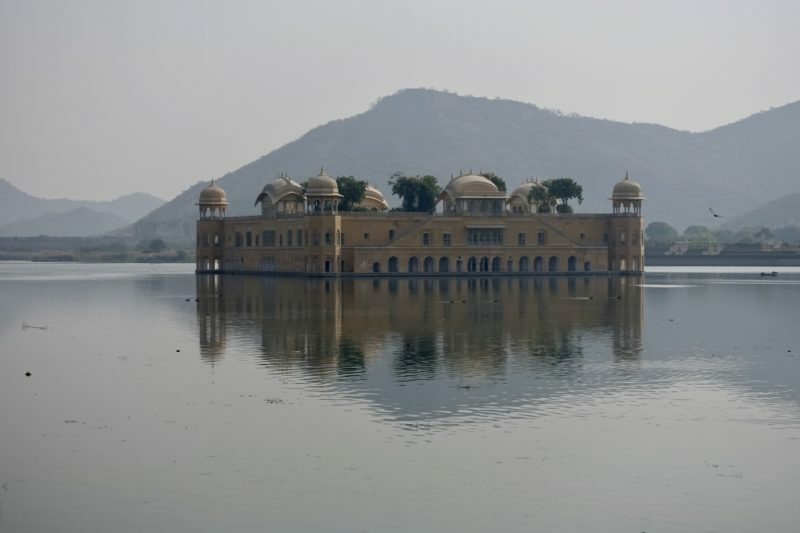 On our way back to town we stopped first at the Jal Mahal, or Water Palace, which is, as it sounds, a palace sourrounded by water. Apparently it is possible to visit it by boat, but we didn’t see any boats around, so took a few quick photos and jumped back into the car. 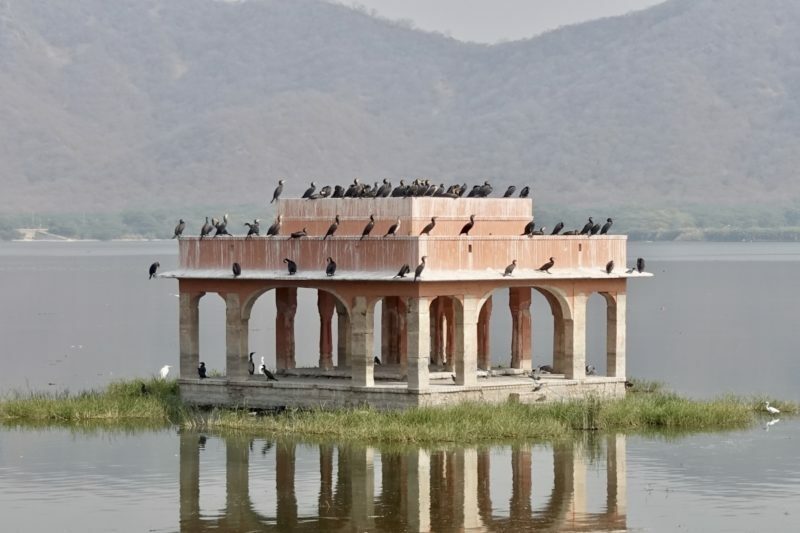 Not far from the Jal Mahal is another pavilion. The perfect place to escape. 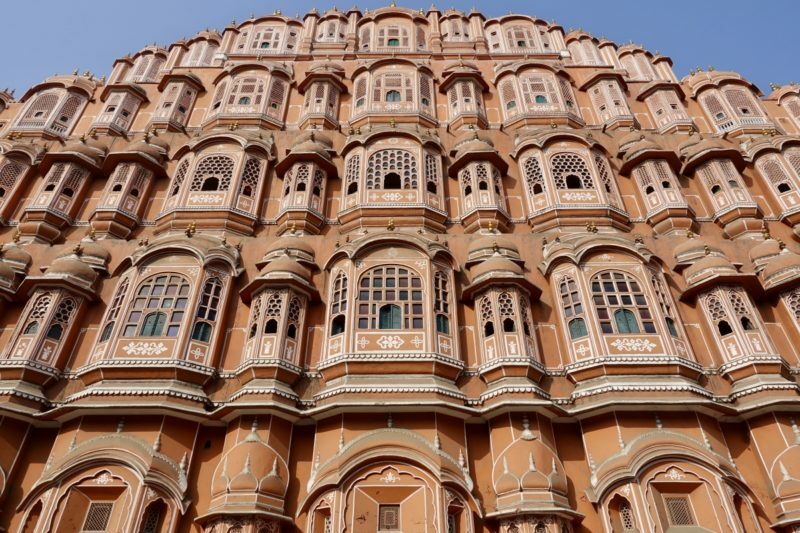 Our next quick stop was at the beautiful Hawa Mahal, or Palace of Wind. I had seen so many photos of this on line, and was so surprised to find the famous facade squashed between buildings on either side on a busy double lane street. There is only a couple of metres of footpath in front blocked off to try to take a quick photo from. The Palace was originally build in 1799 and the main purpose was to allow the ladies of the royal family to be able to watch the streets below from any of the 953 windows without being observed by the public. It is possible to climb to the top of the fifteen metre structure too for views over the city, but because we were mindful of our tight schedule we skipped it this time. 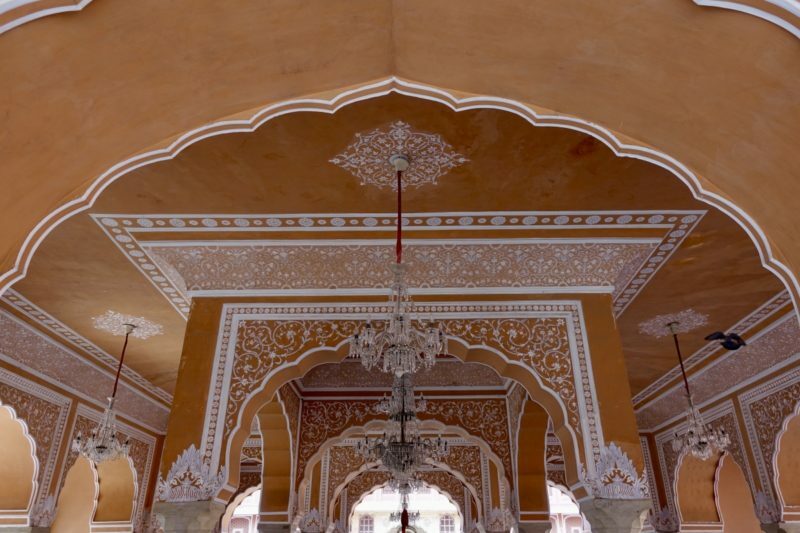 Right in the centre of the Pink City is the City Palace. 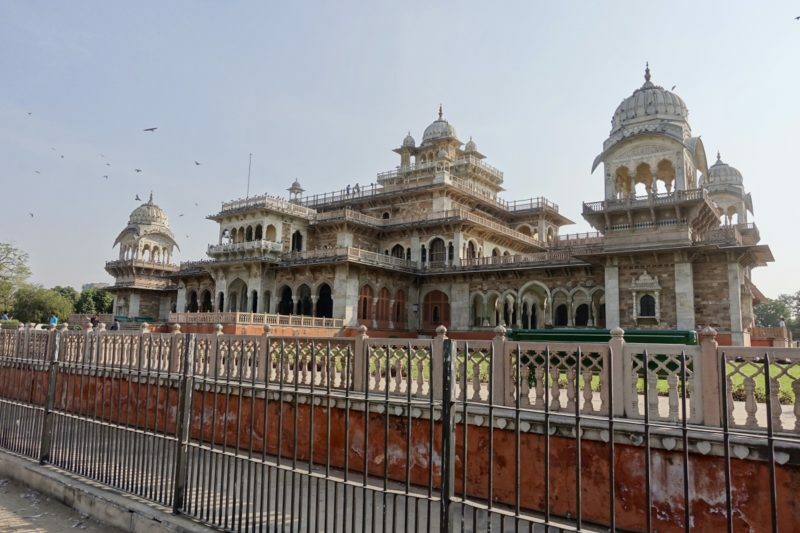 This has now been set up as a museum showing the history of the local Jaipur royal family over the last few centuries. There is a throne room set up as it was, royal clothing and transport. Mostly photos were not allowed, so I only have a couple of shots out in the courtyards. I took way too many photos of decorated doors though – here’s just one. 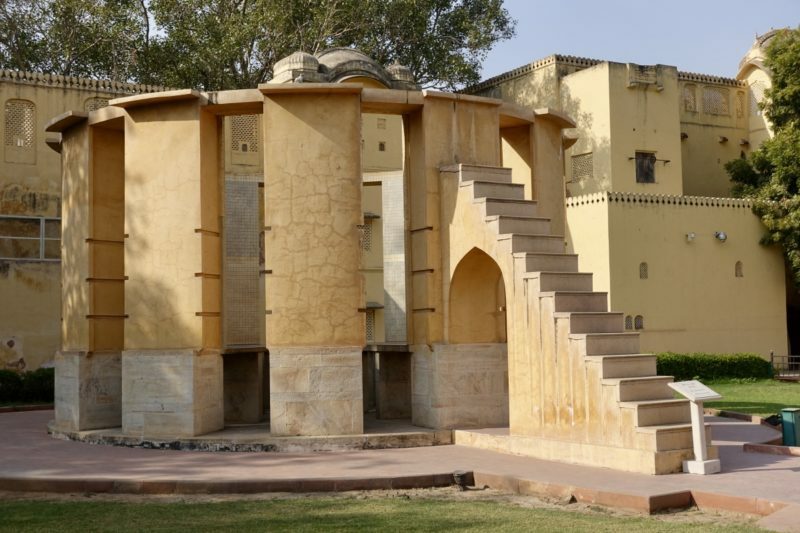 Jantar Mantar (love that name!) was next. 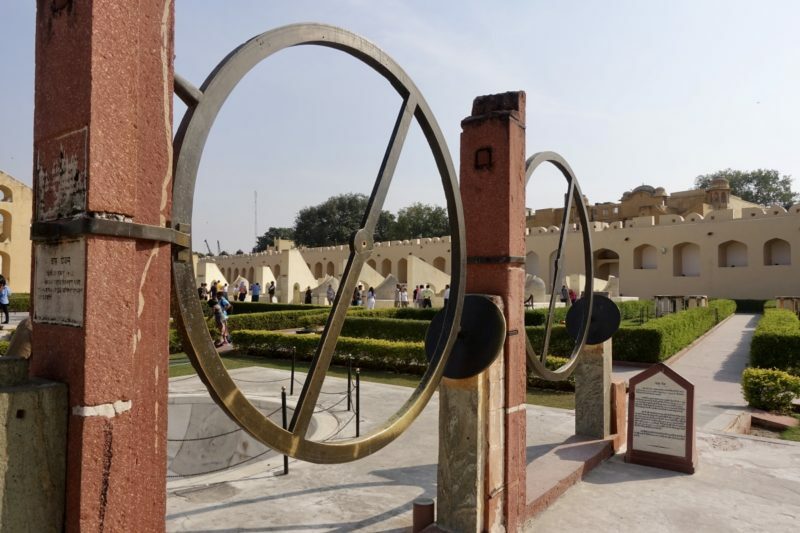 Back in the 1700’s a whole pile of astronomical instruments were built to measure all sorts of stuff, things like time and distance and the location of the planets. The instruments are huge, and I found them surprisingly interesting. We were all musem’ed out at this point, but still wanted to have a look at the beautiful Albert Hall Museum – at least from the outside. The sun was in the wrong spot for good photos but it’s a lovely building. If we were here for more than one day, we would likely have visited inside too, as we have heard the exhibits are worth a look. There was just time for one more stop before our time with our driver was up, and he suggested a quick visit to the Birla Mandir temple. 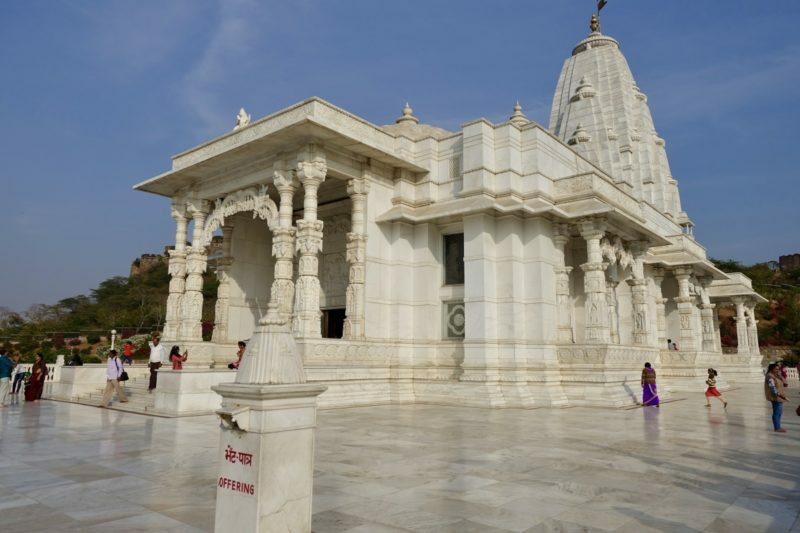 This is a beautiful modern Hindu temple made out of white marble. It is up on the side of a hill overlooking the city. Once into the grounds, it is a peaceful place to spend some time. It was a huge day in Jaipur. It is a very popular tourist destination and as such most of the places we visited were crowded with people. For some unknown reason – to me at least – I was constantly asked to have my photo taken or be in selfies. I also had people just taking my photo without asking. I mean, I’m not young and attractive, I don’t dress up or wear makeup, and I don’t resemble anyone famous, so why? I ended up instructing Simon to stay right near me at all times, because as soon as he moved a few metres away and it looked like we weren’t together the requests became bolder. I had heard reports of some solo female travellers being harassed continuously, so I was probably lucky to just be asked for photos. I did snap at one point. This young girl, about eight years old, walked right up to me and asked for a selfie. I gave her a harsh and blunt “no” and kept walking. I looked at Simon about two seconds later and said “whoops, that was probably a bit harsh!” I still would have said no, but I probably didn’t need to be that rude. The poor girl just asked me when I was at the end of my tether. We were on the move again, this time flying to Kerala. 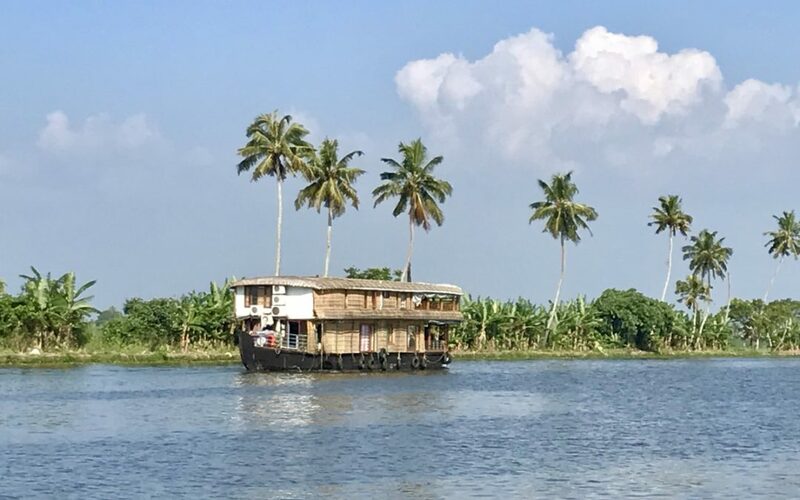 There were no direct flights to Kochi, so we had to take two flights, then two buses to get to Alleppey (or Alappuzha as it is now called). These were local buses, and while crazy cheap (less than a dollar for both of us) they were hot, crowded and a bit bumpy. We got where we were going though, and saved a packet doing so. 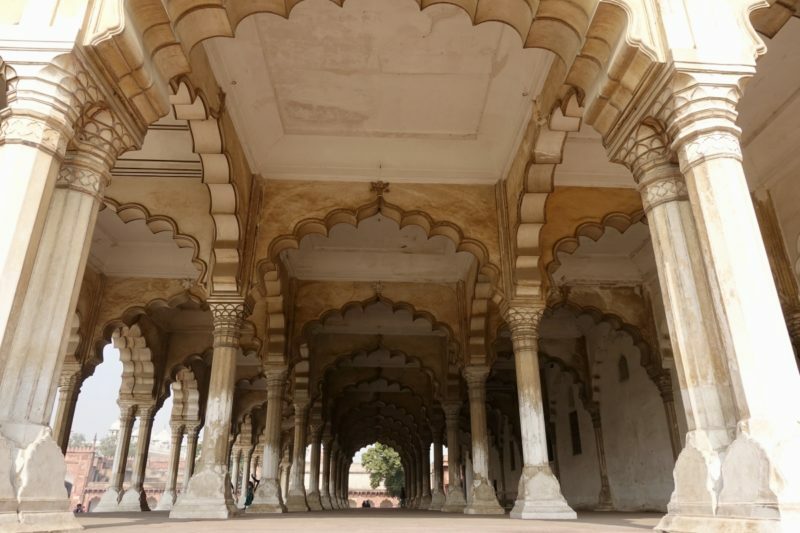 We had almost made up for that crazy expensive car trip to Agra! 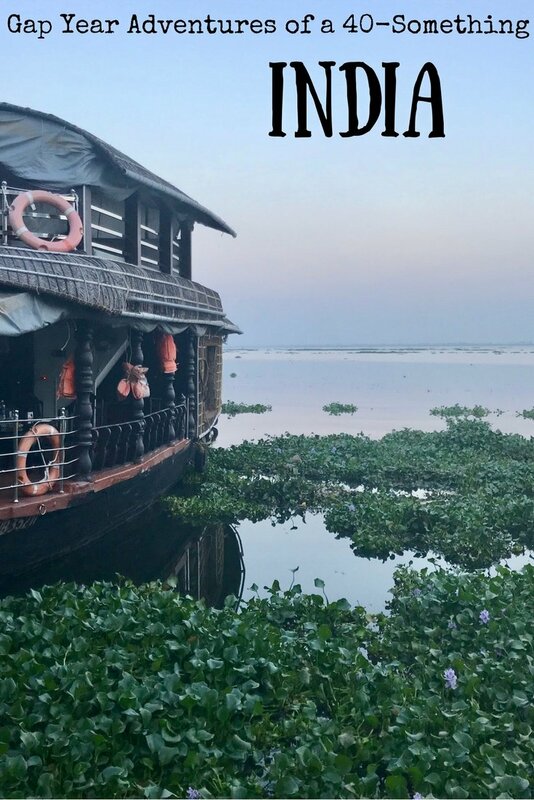 The night was spent chilling out at a hostel before we boarded our Kerala houseboat for three days of almost complete relaxation as it made it’s way around the backwaters! Or at least that’s what we thought would happen. In fact, it was three one day trips, so each day we would have to pack up and disembark, wait a couple of hours, then board the boat for the next day. India is nothing if not interesting! It always kept us guessing. The comfy chairs to sit and watch the world go by. 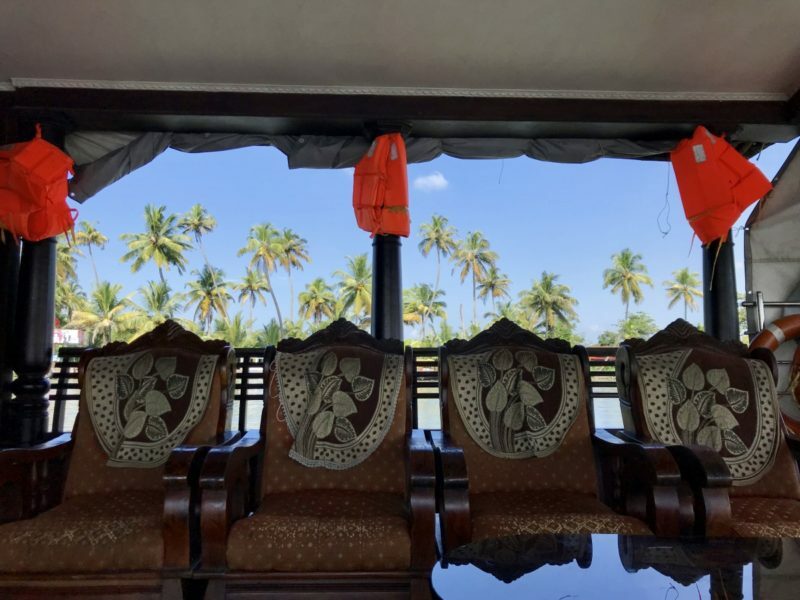 Each night we had honeymooning Indian couples on the boat with us, after all, it was wedding season! Mostly they kept to themselves, but we did chat with them a little. Each day we would get off the boat and head into the office to await our next boat, use the wifi, and organise laundry. I spent over two hours trying to book a flight over the slow internet for it to keep giving me an error as I did the credit card payment. In the end I didn’t know if it was booked once, twice or not at all! Our relaxed state came to an abrupt end as we made our way back to the bus station for the trip back to the airport. “Bus station” is a very loose term. It was like a big parking lot with buses and people going in all directions. There were no signs and nothing in English on the buses to say which one to catch, and of course no ticket offices or information people either. We asked a few others who were clearly tourists, but no one else was going to the airport. Eventually a local man pointed out the correct bus – or at least we hoped it was right. It did go in the right direction, and got us quite close to the airport. A short tuk tuk ride was fittingly the last leg in India. Nearly every adjective can be used in relation to India. It’s fascinating and colourful and interesting and unique and frustrating and disorganised and exhausting. We were glad to be getting on that plane to be leaving, but sad too because there is so much to love about this country. We saw such a small part of India and I honestly can’t wait to get back and explore some more – I just need a break first! Getting around using local transport is cheap, but it is always a chore as the price needs to be negotiated every time. Tuk tuk/auto rickshaw and taxi drivers don’t always know where they are going, so be prepared to give directions. 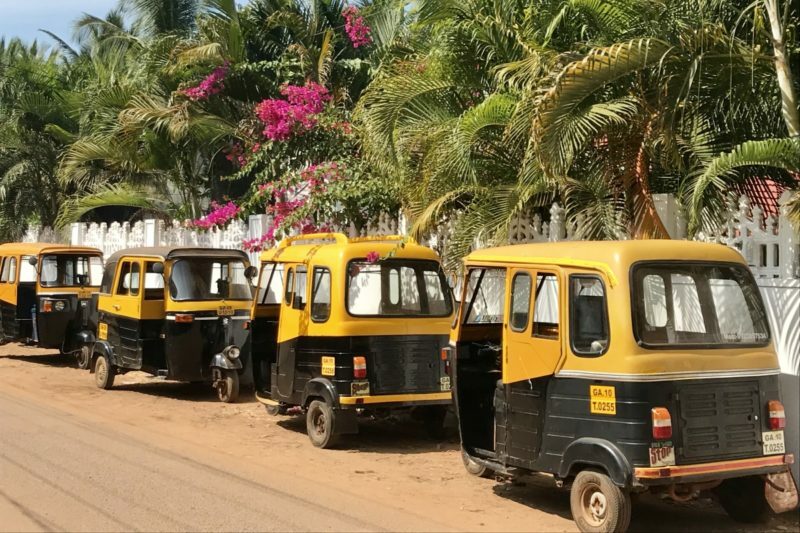 Ola is more common in India than Uber, but the app can only be set up with a local phone number, and tourists can’t get a local number easily. (I have seen online mention of tourists being given free SIM cards on arrival, but I didn’t see any evidence of this and more than one other traveller mentioned not being able to get a local SIM) We used Uber a couple of times, and also got our accomodation to order an Ola once or twice. At least in this case they have the address you are going to already in the system. Wifi in India (at least where we were) is patchy at best. Even in high end hotels we did not have reliable wifi. It would be exceptionably slow or continuously drop out. Every other visitor I spoke with had the same experience, so be prepared while you are there. It’s no surprise that India is a cheap country to travel in. We could easily eat a meal with an alcoholic drink each for less than $10AUD at local places. In hotel restaurants or really touristy areas it was more likely to be $20-30AUD. There is a wide range of accomodation available from dirt cheap to uber-expensive. Liked this post? Please Share with your friends and pin for later. Thanks Josie – will be in Kerala in 2 weeks, staying there for 2 months so this is all very useful. Like you I have never been to India and no idea what to expect. The wifi comment is especially useful as I am trying to decide whether I should work remotely whilst I am there or not. So I’ll probably wait until I get there to assess it all, as I wouldn’t want to disappoint any of my clients. Everyone who has been there says the same things. Beautiful but frustrating. We went on guided tours, rather than try to get around by ourselves. In Mumbai we saw some the the slums on the way to a forest reserve outside, where we were guided around an ancient cave complex, where Buddhist monks stayed and studied. There was one big cave open to the outside along one side, with rows of benches cut from the rock. Little did I know that within a few years I too would be sitting with other students, learning Sanskrit sutras, practicing my Devanagari characters, eating vegetarian meals, meditating, doing much the same as those Indians of a thousand years earlier. In the somewhat more comfortable conditions of a mansion in Sydney. 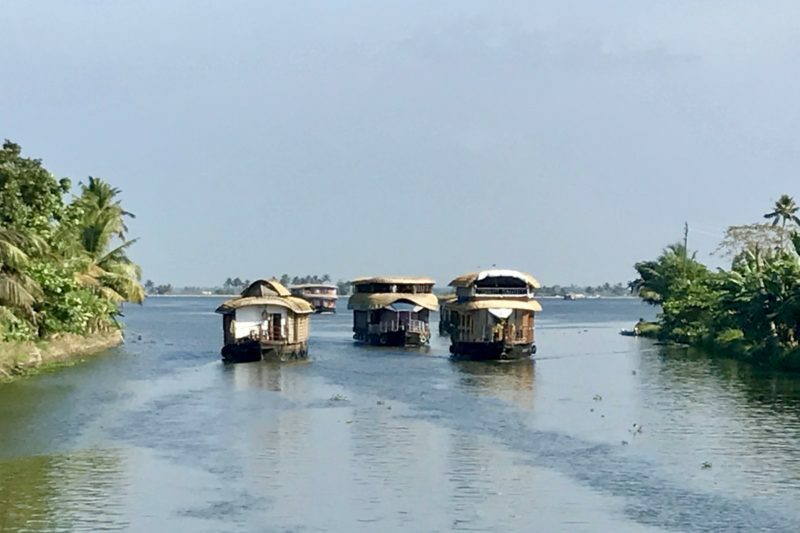 I loved Kochi and the backwaters. I plan to return one day, but I might go a little more upmarket for a houseboat. Many thanks for the review(s) by the way. Thanks Pete. When we go back I probably won’t go on an organised tour but I will plan properly in advance instead of winging it like we did this trip. We were always struggling with how to get to the next place, and we have such a reliance on the internet to do this. It became very stressful at times when we had no or limited wifi. If at least we have a plan, with accomodation and transport booked, dealing with all the day to day frustrations will not be as bad. Very interesting account and quite accurate assessment of the locals. 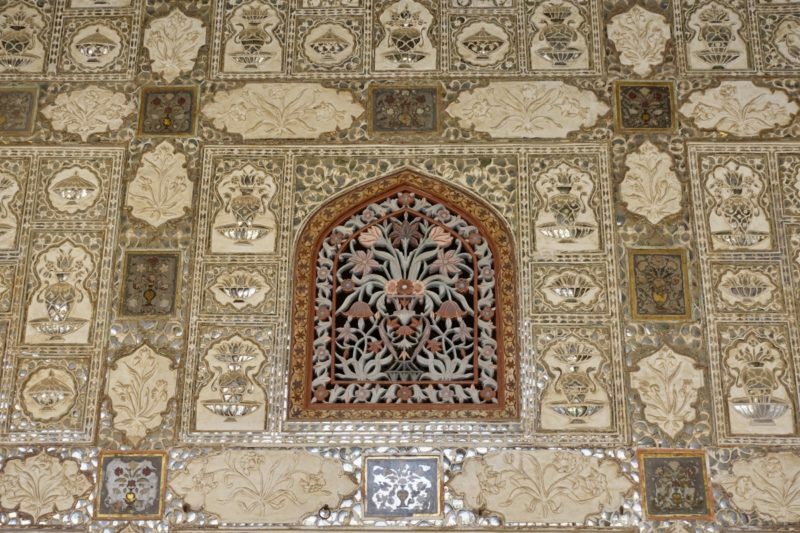 India is full of history, art and culture. The food and music are great yet the people of this region are not what you expect in any part of the world! They love foreigners specially Caucasians. Being ruled by the Mughals (they came from Afghanistan and Turkey, captured and ruled Indian sub continent) and then British empire, Indian drivers still feel compulsive to say yes to you for a ride (even though not knowing the directions) and ask for selfies etc as they loved your skin color! This is all in local psych though city dwellers and educated Indians are very intellectual and courteous. I liked your honest blog, just wanted to clarify some of your intrigues. Have safe travel.